Carnegie Mellon University professor Timothy Verstynen and his collaborator give scientific talks to zombie enthusiasts from coast to coast. Their goal is to get people interested in and learning about neuroscience without even realizing it. In 2010 Verstynen and his fellow researcher, Bradley Voytek, gave their first talk about zombie brains at ZombCon in Seattle. They were surrounded by people from soldiers to film geeks who came dressed up in decaying costumes. "Afterward, a guy who had a fake eyeball hanging out of his eye socket asked me if the orbito-frontal cortex suppresses anger or causes anger," Verstynen explained. "He wasn't a neuroscientist, but he was asking a really interesting neuroscience question." An ex-medic in the audience became curious about the some of the head injuries she'd seen while serving in Iraq. "Without realizing it, she was asking appropriate neurological questions about these people," Verstynen said. Verstynen's "real" research focuses on decision-making systems in the brain and sensorimotor control. The results of his team's recent study on obesity, which was featured on CNN.com, suggests that unhealthy food choices can lead to disrupted brain connections that lead to inefficient brain performance. "That inefficient brain performance then can lead to making more unhealthy choices. So, it appears to be a vicious cycle," Verstynen said. 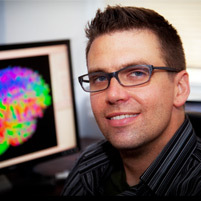 Michael Tarr, a CMU professor and co-director of the Center for the Neural Basis of Cognition, said, "Tim's zombie research is a wonderful example of how CMU's Brain, Mind and Learning Initiative can reach a wider audience and engage people so as to increase their interest in the science of the mind and brain." Tarr added, "Tim is a superb researcher, employing a wide variety of cutting-edge methods. He is also an energetic and creative scientist who is genuinely interested in furthering science education through his extensive outreach efforts." Verstynen and Voytek teamed up to create two animated shorts on the cognitive neuroscience of zombies. They are now working on a book written on a high school junior/senior reading level that will be an expanded form of the lecture they give on zombie brains. "We're going to use forensic neuroscience to diagnose a zombie brain, but we are also going to show the history of neuroscience framed in this zombie metaphor," Verstynen said.